Fugly Horse of the Day: Can anyone translate these ads for me? I thought I was pretty good at reading 8thGradeDropout-ese at this point, but damn...I am stumped at some of this. This is actually a very cute horse who would probably make a lovely pony gelding if someone can get to him before he shreds his pretty little self into ribbons on that barbed wire fence. I also believe we've discussed this seller before, and I don't usually pick on someone twice, but I hadn't seen this, and the e-mail content is just too bad not to share! The emphasis in bold is mine. 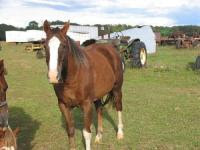 "This is a very nice stallion he has thrown sum very nice colt's, He is out of show stock. He also has Registry pappers for AQHA and APHA I have not sent them In thou, He is out of impressive blood lines and he is built very well, He does not like ohter studs and he tends to attack what he can to get to them, but over all he has a very sweet personality and he thrown 3 aussume foals this year, To learn more about him you can go to Denisstandrige.com Horse ranch IN lamar,Ar this is his mothers blood lines I do not have his fathers"
His markings are described as "sworle." And he's a whopping 14.0 at 5 years of age. What is a sworle? Sounds like some sort of rodent. Perhaps something that swims. "Hi there again. He was born in march of 2003 so that would put him at 5 this year, the breeder is (redacted, it's probably not THEIR fault she's an idiot) in Lamar, Ar I bought him when is was 4Mos old, I am not sure all of her Pedg, but her name on the paper is MPR CIRCUIT BREAKER and the Fathers name is MPR DIVERSE COLORS thy both are Sorrle and White Tobiano. and thy both are 16 hands, My stud ended up being small becouse we weened him to early and we did not have him on starter feed, but other then that his colts well not be small so far thy are growing at a wounderful rate thy are all most as tall as him a 8 mo's old. Oh and befor I for get the dill on the papers is that I never signed them so all you would have to do is sign your name and send them in for the APHA he si soild sorrle with just sum white on his for head and the tip of his nose, I did not ever send in for the App for the AQHA papers I was not buying him to resale him so I did not think that I would ever need to get the papers I know I am crazy for not geting them but I just need to cute back on Horses right know." All right, take a break from banging your heads into the nearest hard surface - there's an interesting element to all of this. She mentions (I have inserted the proper spelling) Dennis Standridge. Now, Dennis seems to have a halfway decent operation (warning for those at work, mute your computer first - bad loud music!). His studs are quality horses, though I have to say that Kid Clusive got the trademark Obvious Conclusion nine-mile-long-back and you all know how I feel about breeding N/H stallions. But he's a huge step up from Backwoods Brandie and you gotta wonder if he knows she's dropping his name (albeit badly spelled). Now here's a gem from Petfinder...seriously, how illiterate can you be? And you're a RESCUE??? "Brud Mayor only.. We have her papers but we have never registered her. 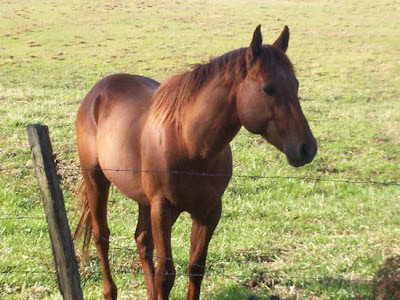 She throws wonderful colts and is a wonderful mother(red is one of her colts) but her will not be riden. She roles.. The right person with enough patience and a gentle heart with her may beable to change this. But a strong headed, hard handed person will not change this instead it will make her worse and she will roll. She ROLLS? Now there is a new one. Do you suppose the poor thing is sore backed, just maybe? And since you can't ride her, you've popped babies out of her...even though you are TOO LAZY to register her and therefore you've created MORE grade horses? Great. You know, it's not necessary to actually create horses you will later have to rescue. They are not in short supply! I need a drink reading this stuff. Can someone send me a margarita?